Today’s picture marks the 37th anniversary of Waddington’s death this week. As I am nearing the completion of the catalogue of his papers, it seems a doubly fitting time to reflect a little on the man he was. Born in Evesham on 8 November 1905 and developing a love of fossils from an early age, Waddington (known to all his friends as ‘Wad’) went on to study Natural Sciences at Cambridge. After working in Operational Research during the Second World War, Waddington was appointed to two positions in Edinburgh: that of chief geneticist at National Animal and Breeding Research Organisation (NABGRO, eventually named ABRO), housed in the Institute of Animal Genetics, and the Chair of Animal Genetics at Edinburgh University. Waddington was to remain at the Institute of Animal Genetics for the rest of his life, barring a few years at the State University of New York at Buffalo, where he held the Albert Einstein Chair of Science in the early 1970s. Waddington is renowned for his developmental biology work and his proposal of such concepts as canalisation and epigenetics . However, his papers reveal the vastly full and varied life he lived outside of his research and publishing work, not least the number of societies and organisations with which he was involved. Wad was a great believer in the power of science to educate, inform and help prepare a better future, and he utilised biological and evolutionary reference models as a way of analysing issues concerning human population and health, as well as the environment. Wad also had a major role in the expansion of the biological faculty of the University of Edinburgh. The items in the photograph above are part of the collection of material, letters, ephemera and pictures that were collected from Waddington’s desk after his death and have remained more or less in their original order to this day. A lot more information about Waddington and our collection of his papers will be available via the online catalogue, hopefully appearing in early 2013. Watch this space! Is the online catalogue of Waddington’s papers available yet? Eager to see what the holdings are. 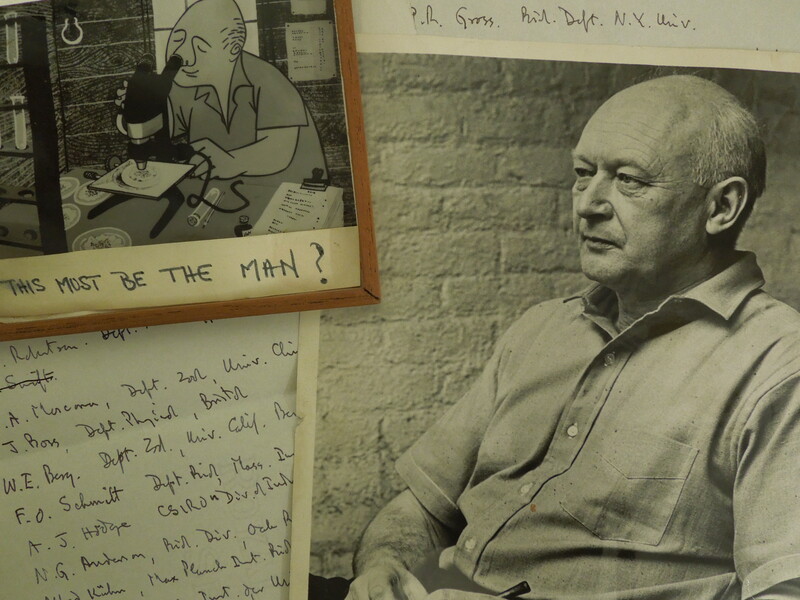 Really pleased to hear of your interest in the Waddington papers. Our online catalogue will hopefully be launched within the next couple of months if not sooner – but in the meantime, if you have any specific queries, feel free to drop me a line at clare.button@ed.ac.uk and I can search the catalogue for you.